This post was kindly contributed by The DO Loop - go there to comment and to read the full post. In numerical linear algebra, there are often multiple ways to solve a problem, and each way is useful in various contexts. In fact, one of the challenges in matrix computations is choosing from among different algorithms, which often vary in their use of memory, data access, and speed. This article describes four ways to perform the sum of squares and crossproducts matrix, which is usually abbreviated as the SSCP matrix. The SSCP matrix is an essential matrix in ordinary least squares (OLS) regression. The normal equations for OLS are written as (X`*X)*b = X`*Y, where X is a design matrix, Y is the vector of observed responses, and b is the vector of parameter estimates, which must be computed. The X`*X matrix (pronounced “X-prime-X”) is the SSCP matrix and the topic of this article. That is because the SSCP matrix for an n x p data matrix is a symmetric p x p matrix. When n ≫ p, forming the SSCP matrix requires computing with a lot of rows. After it is formed, it is relatively simple to solve a p x p linear system. Conceptually, the simplest way to compute the SSCP matrix is by multiplying the matrices in an efficient manner. This is what the SAS/IML matrix language does. It recognizes that X`*X is a special kind of matrix multiplication and uses an efficient algorithm to form the product. However, this approach requires that you be able to hold the entire data matrix in RAM, which might not be possible when you have billions of rows. The (i,j)th element of the SSCP matrix is the inner product of the i_th column and the j_th column. In general, Level 1 BLAS computations (inner products) are not as efficient as Level 3 computations (matrix products). The third approach is to compute the SSCP matrix as a sum of outer products of rows. Before I came to SAS, I considered the outer-product method to be inferior to the other two. After all, you need to form n matrices (each p x p) and add these matrices together. This did not seem like an efficient scheme. 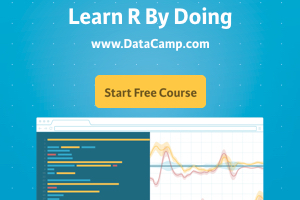 However, when I came to SAS I learned that this method is extremely efficient for dealing with Big Data because you never need to keep more than one row of data into memory! A SAS procedure like PROC REG has to read the data anyway, so as it reads each row, it also forms outer product and updates the SSCP. When it finishes reading the data, the SSCP is fully formed and ready to solve! I’ve recently been working on parallel processing, and the outer-product SSCP is ideally suited for reading and processing data in parallel. Suppose you have a grid of G computational nodes, each holding part of a massive data set. 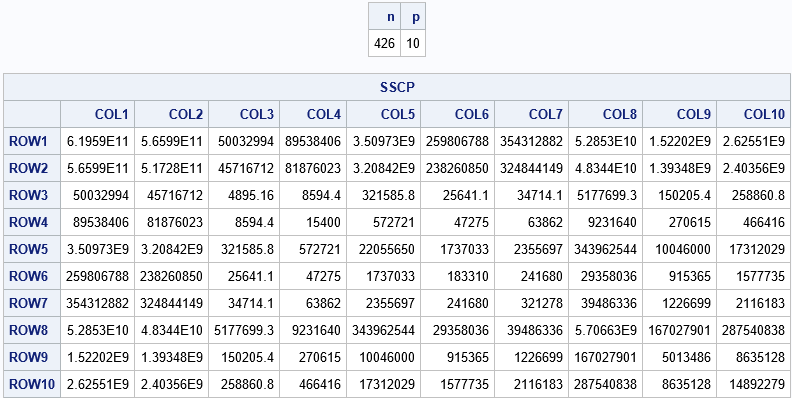 If you want to perform a linear regression on the data, each node can read its local data and form the corresponding SSCP matrix. To get the full SSCP matrix, you merely need to add the G SSCP matrices together, which are relatively small and thus cheap to pass between nodes. Consequently, any algorithm that uses the SSCP matrix can greatly benefit from a parallel environment when operating on Big Data. You can also use this scheme for streaming data. For simplicity, the previous algorithm works on one row at a time. However, it can be more efficient to process multiple rows. You can easily buffer a block of k rows and perform an outer product of the partial data matrix. The value of k depends on the number of variables in the data, but typically the block size, k, is dozens or hundreds. In a procedure that reads a data set (either serially or in parallel), each operation would read k observations except, possibly, the last block, which would read the remaining observations. The following SAS/IML statements loop over blocks of k=10 observations at a time. All computations result in the same SSCP matrix. The following statements compute the sum of squares of the differences between elements of X`*X (as computed by using matrix multiplication) and the other methods. The differences are zero, up to machine precision. In summary, there are several ways to compute a sum of squares and crossproducts (SSCP) matrix. If you can hold the entire data in memory, a matrix multiplication is very efficient. If you can hold two variables of the data at a time, you can use the inner-product method to compute individual cells of the SSCP. Lastly, you can process one row at a time (or a block of rows) and use outer products to form the SSCP matrix without ever having to hold large amounts of data in RAM. This last method is good for Big Data, streaming data, and parallel processing of data. The post 4 ways to compute an SSCP matrix appeared first on The DO Loop.